The PowerLight 3 Series is designed for the most demanding live audio users, whether in touring rigs or fixed installations. The most requested features of the PowerLight 2 series have been upgraded to deliver "the ultimate analog amplifier", while the QSC Dataport ensures full compatibility with Q-Sys and QSControl.net systems. The PowerLight 3 Series is designed for the most demanding live audio users, whether in touring rigs or fixed installations. The most requested features of the PowerLight 2 series have been upgraded to deliver "the ultimate analog amplifier", while the QSC Dataport ensures full compatibility with advanced digital processing and QSControl.net. Three models range in power from 1250 watts to 4000 watts per channel at two ohms, all in two-rack space chassis that are only 15.6" (40 cm) deep and 22 lbs (10 kg). In addition to higher power, the PowerLight 3 Series offers higher input voltage, selectable sensitivity, and easily adjusted rear panel switches with color coded LED indicators. For those users who simply want a high performance amplifier to go with their existing processor or console, the PowerLight 3 Series is an ideal choice, offering high power, excellent value, and zero signal latency. When complete integration of amplifier control, monitoring and DSP is desired, the PowerLight 3 Series is fully compatible with the QSControl.net BASIS networked audio platform, with its comprehensive drag and drop DSP functionality. Simpler DSP requirements can be met with the DSP-4 processing module. Comprehensive full range power ratings with explanations can be found in the following paper: Full Range Power Ratings for PL3 Series (PDF 308K) The flagship of the PowerLight 3 Series is the new 8000 watt PL380. This highly refined, all-switchmode amplifier incorporates nearly 40 years of QSC engineering experience, resetting expectations for Class D audio quality. 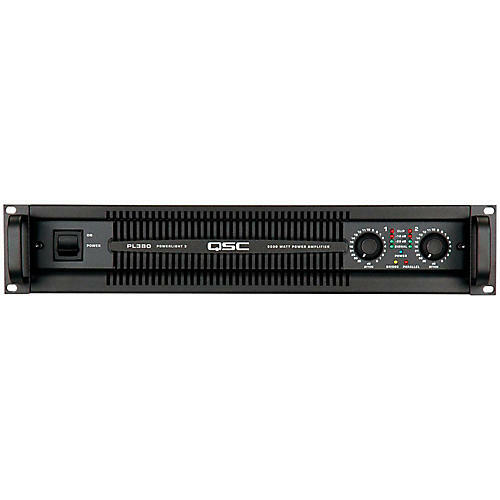 The PL380 combines a pair of 4000 watt Class D amplifier channels with the well proven PowerLight supply, to deliver more than twice as much audio power as previous 2 rack unit PowerLight amplifiers. Reactive "back EMF" from the speaker is recycled to the power supply, and unmatched "plug-to-plug" efficiency of 85% keeps AC power needs to a minimum, while delivering more energy to the speaker. Years of patient development have resulted in outstanding 20Hz - 20kHz audio performance, plus complete protection from normal hazards of the trade. Even simple features such as dependably silent, surge-free on/off switching indicate the special care taken to keep things safely under control. The most pronounced "sonic signature" of the PL380 is one of immense headroom, sailing through even the most difficult loads with no signs of stress or change of tonality.